HOW, HENRY, chemist, mineralogist, and educator; b. 11 July 1828 in London, England, son of Thomas How; d. 28 Sept. 1879 at Windsor, N.S. He married, probably in Great Britain, Louisa Mary Watkins, and they had five children. Educated at a private school in Beaconsfield and at the Royal College of Chemistry, Henry How then became assistant to Dr Lyon Playfair, professor of chemistry at the College for Civil Engineers, Putney. How was analytical chemist for the Admiralty Steam Navy Coal Enquiry; he also worked with Dr Thomas Anderson first at the University of Edinburgh and then at Glasgow university. In 1854, on Dr Anderson’s recommendation, he was appointed professor of natural history and chemistry at King’s College, Windsor, N.S. He was given an honorary dcl by King’s in 1861, and appointed vice-president of the university in 1877; he also served as librarian and curator of the university museum. In 1861 How was appointed to the Nova Scotia Board of Commissioners responsible for arranging displays at the London International Exhibition of 1862, and was selected to make an illustrative collection of Nova Scotia minerals. He was one of the organizers in 1862 (with John Matthew Jones, Dr Alexander Forrester*, Dr J. B. Gilpin*, John R. Willis, R. G. Haliburton*, Captain Campbell Hardy, and others) of the Nova Scotian Institute of Science, an organization which grew out of the interest aroused by the display of the province’s natural resources at the London Exhibition. Over the years he contributed ten papers to the Transactions of the institute. How also prepared a collection of minerals for the Paris Exposition of 1867, and this collection became the basis of the Nova Scotia Museum, founded in 1868. He brought the most recent chemical techniques from Europe to Nova Scotia and provided Nova Scotia students with an alternative to classical studies. In addition to his 25-year career as a teacher, he constantly corresponded with learned men in Great Britain, carried on original research in both analytical chemistry and mineralogy, and served as a consultant to government and industry. Through his pupils and his writings, he strongly influenced science in Nova Scotia in the 19th century. 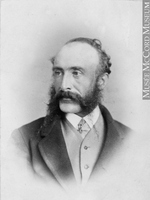 His chief work was The mineralogy of Nova Scotia (1869), consulted and used for many years. He discovered and named several Nova Scotia minerals; “howlite” was named in his honour by one of his students. He contributed at least 44 papers on chemistry, analytical chemistry, mineralogy, and botany to British, American, and Canadian periodicals. Henry How, Sketch of the mineralogy of Nova Scotia, as illustrated by the collections of minerals sent to the Paris Exhibition, 1867 (Halifax, 1867); The mineralogy of Nova Scotia: a report to the provincial government (Halifax, 1869). PANS, Nova Scotia provincial secretary’s papers, 1867, 3189. Morning Herald (Halifax), 29 Sept. 1879. King’s College (Windsor, N.S. ), Calendars, 1855–80; Record, I (1879), 73–74. F. W. Vroom, King’s College: a chronicle, 1789–1939, collections and recollections (Halifax, 1941). Harry Piers, “A brief historical account of the Nova Scotia Institute of Science, and the events leading up to its formation; with biographical sketches of its deceased presidents and other prominent members,” N.S. Inst. of Sci., Proc. and Trans., XIII (1910–14), liii–cxii. Phyllis R. Blakeley, “HOW, HENRY,” in Dictionary of Canadian Biography, vol. 10, University of Toronto/Université Laval, 2003–, accessed April 24, 2019, http://www.biographi.ca/en/bio/how_henry_10E.html.